Home ▸ Blog ▸ General ▸ Happy Birthday, Hubby! It was my husband’s birthday in the middle of March, but I can only now show you his birthday card, as I used the new products from the mini catalogue! I like this card, as it’s simple yet effective, but it does prove we’re growing up as it’s relatively elegant, I think. I’m not sure whether I want to grow up! He seemed pleased, which is always a good thing. Stamp Sets: Broadsheet Alphabet, Four Frames, Itty Bitty Bits. Punch: Itty Bitty Shapes Punch Pack. Colours: Marina Mist, More Mustard, Pear Pizazz. 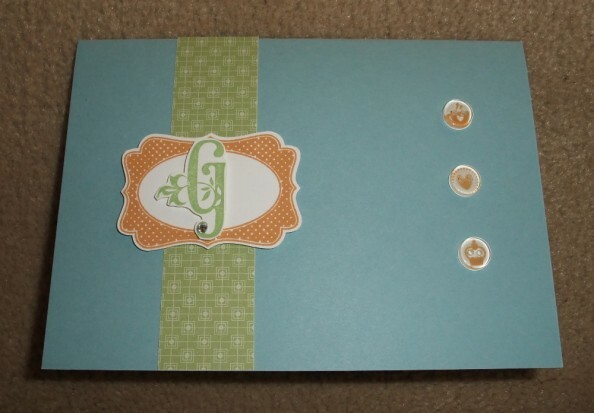 Accessories: Basic Rhinestones, Bitty Buttons, Designer Series Papers.